The study examines responses from 54 individuals who work in the field. The survey was conducted in Spring 2008. The report was coauthored by Susan Schreibman, director of the Digital Humanities Observatory in Dublin, Ireland, and Ann Hanlon, the digital projects librarian at Marquette University. Digital humanities is a new twist on a centuries-old profession. 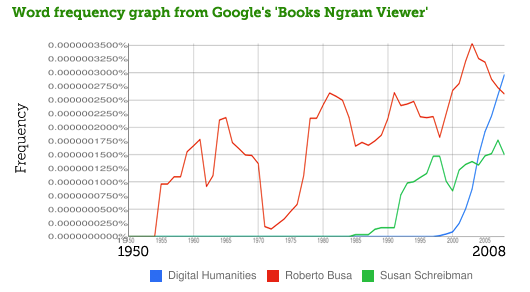 Roberto Busa, a founder in digital humanities, wrote in 2008 (in a book co-edited by Schreibman), “Humanities computing is precisely the automation of every possible analysis of human expression (therefore it exquisitely a “humanistic” activity), in the widest sense of the word, from music to theater, from design and painting to phonetics, but whose nucleus remains the discourse of written texts.” Father Busa is an Italian Jesuit priest and early pioneer in the usage of computers for linguistic and literary analysis. Digital Humanities as a field has been pushing the boundaries of what is considered scholarship: from the creation of thematic research collections to e-literature. New tools that foster new insights into work with the ever increasing amount of digital data available to us are not a luxury but a necessity: who better to develop them than humanists who have both a knowledge of the content domain and of the content as data. Want more cool graphs? Here’s “10 Fascinating Word Graphs, From 200 Years of Google Books” in a blog post by Marshall Kirkpatrick at ReadWriteWeb.